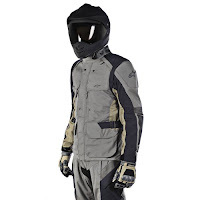 After years of R&D and manufacturing for both the street riding & off-road realms, Alpinestars has taken all of their laborious effort and put it into their new Tech Touring Gear. 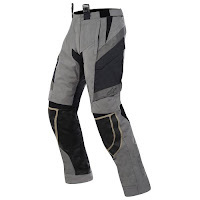 Built on a 600D shell with a removable Gore-Tex Paclite waterproof breathable membrane and loaded with SuperFabric and ripstop reinforcements, the Alpinestars Durban Gore-Tex Jacket & Alpinestars Durban Gore-Tex Pants are the pinnacle of Alpinestars textile gear to date. Designed as an all-season all-weather impenetrable ADV touring outfit, the A*Stars Durban goes head-to-head with the apex pieces from other manufacturers. 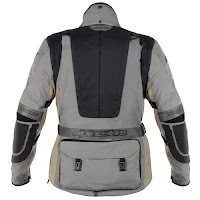 Alpinestars is mostly recognized as a leading racing gear manufacturer, and it is little known that they have been producing technical off-road apparel since the mid-1970s. 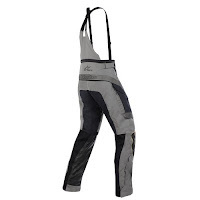 In the impact areas, the shoulders, elbows and knees, you'll find SAS-TEC armor. Exceeding the CE rating scale, SAS-TEC provides molecular-level protection from impacts. This translates to lightweight armor that is soft and flexible to the touch for comfort but becomes absolutely rigid upon impact and disperses energy across the armor. SuperFabric, another futuristic technology, can be found as reinforcements in all impact areas. This material is comprised of tiny laser-welded ceramic plates that are heat-resistant and provide 14x the abrasion resistance of Kevlar. In a get-off situation, if you slide, this material will not burn through and will keep you that much more protected than any other fabric. The Paclite Gore-Tex membrane that exists as a removable membrane is one of Gore-Tex's lightest yet most durable waterproof breathable technologies. Gore-Tex produces the most waterproof and breathable garments on the market, providing 2x the performance of other manufacturers. Further versatility comes with the 2-Liter pouch for a hydration system and the large rabbit pouch at the small of the back. 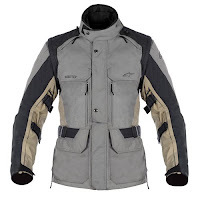 The sleeves of the jacket are detachable in the event that you want to wear just the vest over a compression suit and they fit conveniently into the back pouch. large intake and exhaust panels. This suit should be on every serious ADV rider's radar when it's time to make a new investment. Check out the competition by visiting Extreme ADV Motorcycle Gear at RevZilla.com.